Maple is the common name for any member of the flowering plant genus Acer, a group of about 125 species of mostly deciduous trees and shrubs in the Northern Hemisphere. Most maples are native to Asia, but several species also occur in North America, northern Africa, and Europe. They are characterized by opposite, generally palmate (divided into many lobes) leaves, and fruit that is borne in pairs with two long wings for wind dispersal. Reflecting the principle that living organisms not only seek their own individual purposes (survival, maintenance, development, reproduction), but provide value to other entities (such as the ecosystem and human beings), maples provide numerous ecological, commercial, and aesthetic values. Ecologically, they provide a habitat and food for many animals, including an early season source of pollen and nectar for bees. Commercially, various species are a source of timber, used for furniture, flooring, and many other products, and their sap can be used to produce maple syrup for human consumption. Aesthetically, humans plant trees for ornamental purposes and shade, and the rich colors of the autumn foliage of maple forests is a considerable tourist attraction. The word Acer is derived from a Latin word meaning "sharp" (referring to the characteristic points on the leaves) and was first applied to the genus by the French botanist Joseph Pitton de Tournefort in 1700 (van Geleren and van Gelderen 1999). While maples are now planted widely as ornamental plants, they are generally found in temperate regions or mountain slopes in more tropical regions. Most species are trees that grow to ten to 40 meters (30-130 feet) in height. However, there are also shrubs that are less than ten meters tall and with a number of small trunks originating at ground level. Most species are deciduous, but a few in southern Asia and the Mediterranean region are evergreen. Maples are distinguished by opposite leaf arrangement. The leaves in most species are palmately veined and lobed, with three to nine veins each leading to a lobe, one of which is in the middle. A small number of species differ in having palmate compound, pinnate (two rows of leaflets) compound, pinnate veined, or unlobed leaves. Several species, including the paperbark maple (Acer griseum), Manchurian maple (Acer mandshuricum), Nikko maple (Acer maximowiczianum), and three-flowered maple (Acer triflorum), have trifoliate leaves. One species, Manitoba maple (Acer negundo), has pinnately compound leaves that may be simply trifoliate or may have five, seven, or rarely nine leaflets. One maple, the hornbeam maple (Acer carpinifolium), has pinnately-veined simple leaves that resemble those of hornbeam (a genus of relatively small hardwood trees). Maple flowers are regular, pentamerous, and borne in racemes, corymbs, or umbels. Pentamerous means that they are arranged in roughly equal parts around a central axis at orientations of 72° apart. Maple flowers have five sepals, five petals about one to six mm long, 12 stamens about six to ten mm long in two rings of six, and two pistils or a pistil with two styles. The ovary is superior and has two carpels, whose wings elongate the flowers, making it easy to tell which flowers are female. Maples flower in late winter or early spring, in most species with or just after the leaves appear, but in some before them. Maple flowers are green, yellow, orange, or red. Though individually small, the effect of an entire tree in flower can be striking in several species. Some maples are an early spring source of pollen and nectar for bees. The distinctive fruit are called "samaras" or "maple keys." These seeds occur in distinctive pairs, each containing one seed enclosed in a "nutlet" attached to a flattened wing of fibrous, papery tissue. They are shaped to spin as they fall and to carry the seeds a considerable distance on the wind. Seed maturation is usually in a few weeks to six months of flowering, with seed dispersal shortly after maturity. Most species require stratification in order to germinate, and some seeds can remain dormant in the soil for several years before germinating (van Geleren and van Gelderen 1999). Maples are variously classified in a family of their own, the Aceraceae, or (together with the Hippocastanaceae) included in the family Sapindaceae. Modern classifications, including the Angiosperm Phylogeny Group classification, favor inclusion in Sapindaceae. Maple leaves are consumed by the larvae of a number of Lepidoptera species, and aphids are very common sap-feeders on maples. Maples are affected by a number of fungal diseases. Several are susceptible to Verticillium wilt caused by Verticillium species, which can cause significant local mortality. Sooty bark disease, caused by Cryptostroma species, can kill trees which are under stress due to drought. Death of maples can also be caused more rarely by Phytophthora root rot and Ganoderma root decay. Maple leaves in late summer and autumn are commonly disfigured by "tar spot" caused by Rhystima species and mildew caused by Uncinula species, though these diseases do not usually have an adverse effect on the trees' long-term health (Phillips and Burdekin 1992). Maples are important as sources of maple syrup and wood. They are also cultivated as ornamental plants, and have benefits for tourism and agriculture. Japanese maple (Acer palmatum) has over 1,000 cultivars. This cultivar is A. palmatum "Sango kaku," sometimes called "coralbark maple." Maples are planted as ornamental trees by homeowners, businesses, and municipalities. Norway maple (A. platanoides) is especially popular as it is fast-growing and extremely cold-resistant, though is also an invasive species in some regions. Other maples, especially smaller or more unusual species, are popular as specimen trees (van Geleren and van Gelderen 1999). They provide shade and aesthetic values. Numerous maple cultivars (cultivated plants that have been selected and given a unique name) have been selected for particular characteristics and can be propagated only by grafting. Japanese maple (A. palmatum) alone has over 1,000 cultivars, most selected in Japan, and many of them no longer propagated or not in cultivation in the western world (van Geleren and van Gelderen 1999). Some delicate cultivars are usually grown in pots and rarely reach heights of more than 50-100 centimeters. Maples are a popular choice for the art of bonsai (aesthetic miniaturization of trees by growing them in containers). Japanese maple, trident maple (A. buergerianum), amur maple (A. ginnala), field maple (A. campestre), and Montpellier maple (A. monspessulanum) are popular choices and respond well to techniques that encourage leaf reduction and ramification, but most species can be used (van Geleren and van Gelderen 1999). Maple collections, sometimes called aceretums, occupy space in many gardens and arboreta around the world including the "five great W's" in England: Wakehurst Place Garden, Westonbirt Arboretum, Windsor Great Park, Winkworth Arboretum, and Wisley Garden. In the United States, the aceretum at the Harvard-owned Arnold Arboretum in Boston is especially notable. In the number of species and cultivars, the Esveld Aceretum in Boskoop, Netherlands is the largest in the world (van Geleren and van Gelderen 1999). Many Acer species have bright autumn foliage, including bright red, orange, and yellow colors. Tourism during the autumn to areas with such foliage can be very popular, and many countries have leaf-watching traditions. In Japan, the custom of viewing the changing color of maples in the autumn is called "momijigari." Nikko and Kyoto are particularly favored destinations for this activity. The particularly spectacular fall colors of the red maple (A. rubrum) are a major contributor to the seasonal landscape in southeastern Canada and in New England. Fall tourism is a boom to the economy of this region, especially in Vermont, New Hampshire, and Western Massachusetts, as well as parts of New York and Pennsylvania. In the American Pacific Northwest, it is the spectacular fall colors of the vine maple (A. circinatum) that draw tourists and photographers. The sugar maple (Acer saccharum), also called hard maple or rock maple, is tapped for sap, which is then boiled to produce maple syrup or made into maple sugar or maple candy. Syrup can be made from closely-related species as well, such as the black maple, but their output is generally considered inferior. Some of the larger maple species have valuable timber, particularly sugar maple (hard maple) in North America, and sycamore maple in Europe. Maple is one of the most popular trees for hardwood lumber, and is used for hardwood floors, furniture (cabinets, dressers, tables, etc. ), crates, railroad ties, construction, and other purposes. Sugar maple wood is the wood of choice for bowling pins, bowling alley lanes, drums, and butcher's blocks. Maple wood is also used for the production of wooden baseball bats, though less often than ash or hickory. Some maple wood has a highly decorative wood grain, known as flame maple and quilt maple. This condition occurs randomly in individual trees of several species, and often cannot be detected until the wood has been sawn, though it is sometimes visible in the standing tree as a rippled pattern in the bark. Maple is considered a tonewood, or a wood that carries sound waves well, and is used in numerous instruments such as guitars and drums. As they are a major source of pollen and nectar in early spring before many other plants have flowered, maples are important to the survival of honeybees that play a commercially-important role later in the spring and summer. Maple is also popular among toy manufacturers, most notably wooden toy trains. The flag of Canada depicts a stylized maple leaf and is a prominent national symbol. In the United States, the maple has been adopted by five states as their official state tree. 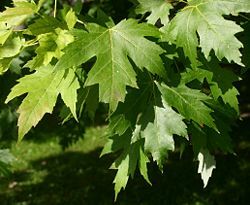 The sugar maple was adopted by New York, Vermont, Wisconsin, and West Virginia. 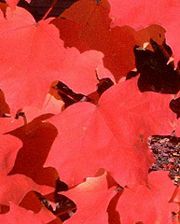 The red maple was adopted as the state tree of Rhode Island. Bench made of highly-figured maple. Phillips, D.H., and D.A. Burdekin. 1992. Diseases of Forest and Ornamental Trees. Macmillan. ISBN 0333494938. Van Gelderen, C.J., and D.M. van Gelderen. 1999. Maples for Gardens: A Color Encyclopedia. Portland, Or: Timber Press. ISBN 0585254575. Vertrees, J.D., and P. Gregory. 2001. Japanese maples: Momiji and kaede. Portland, Or: Timber Press. ISBN 0881925012.